Hawaiian Airlines has launched non-stop service from Boston to Honolulu. Getting to Hawaii from Boston just got a lot easier! For the first time ever, Hawaiian Airlines has launched non-stop service to Boston. The inaugural flight arrived at Logan Airport Friday morning from Honolulu's Daniel K. Inouye International Airport. A ceremony to celebrate the event included traditional Hawaiian song, dance, and lei giving. On hand for the event was Hawaiian Airlines CEO Peter Ingram and Massport Acting CEO John Pranckevicius. "As Hawaii's airline, we take great pride in sharing our love of these Islands, and as we welcome our newest guests from the East Coast, we are confident they will find that their vacation begins and ends with us," said Ingram. "We also want to help Hawaii residents get to where they want to go, and we know that people here travel to New England frequently." The airline plans to offer flights five times a week. According to the airline, the HNL-BOS route is the longest regularly scheduled interstate route in U.S. history at 5,095 miles. The flight will take between 10 and 11.5 hours. According to the Hawaii Tourism Authority, about 127,000 New Englanders visited Hawaii last year. 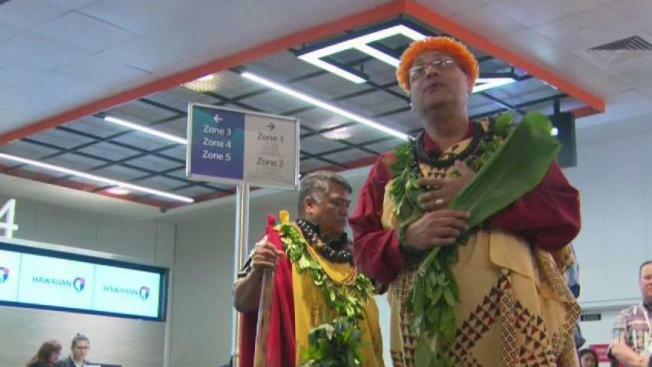 "We are excited to welcome Hawaiian Airlines and their nonstop service that connects New England to the Pacific," said Pranckevicius. "As another winter ends, these flights out of Logan Airport offer Bostonians access to all the natural wonders of Honolulu and the Hawaiian Islands."